Royal Blog Tour – Party This Way! Good day and welcome my royal patrons! I am Princess Pam and tis’ a “Sunny” time for a Royal Tour! Verily, I welcome thee to the SunnyGirlScraps Royal Palace with a merry Huzzah. I pray thee has enjoyed visiting the other Royal Castles! Tis’ many wondrous ideas and projects being shared by my fellow Princesses. Now, twould please me greatly to have thee peruse my Castle. Mayhap thee will find inspiration here! Tis’ time to “Party This Way” as I highlight this stamp set. 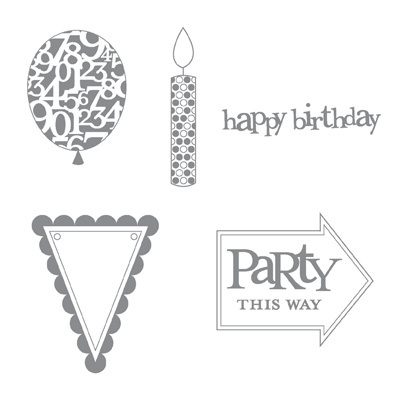 In faith, ’twas easy to use this fun stamp set as ’tis especially great for creating party themed cards and favors. Most recently, I used the “Party This Way” stamp set to create invitations for my son’s first birthday along with party favors, decorating his birthday hat and his birthday card along with creating a couple of scrapbook pages! Verily thee may also desire the opportunity to win some blog candy! To be entered into a drawing for blog candy, thee MUST send an email to [email protected] and include thy NAME along with thine EMAIL so I may contact thee if thou dost win. I also pray that thee would leave a comment on my post. Hear Ye! Hear Ye! Thou hast been issued an invitation to “Party This Way.” This was a fun invitation to make for my son’s 1st birthday and ’twas wonderful to have my non-crafty husband help with making 50 of these invites! I came up with the design and my husband actually did most of the cutting and punching while I stamped and assembled the pieces. Pray tell, mine husband did a wonderful job did he not? Now, every little lad must have a cute birthday hat for his celebration! I used the Celebrations Party Hats (Item # 118716) to make party hats for all the royal lads and ladies in attendance. Of course, the Royal Prince required a specially decorated hat showing that he was the birthday lad turning one! Along with the hats, each little royal lad and lady in attendance received a party favor. For the party favor, I used the Candy Wrapper die for the Big Shot then decorated the Candy Wrapper with the Celebrations Designer Series Paper and the “Party This Way” balloons. Inside the Candy Wrapper were the small party bubbles. The birthday card for my little Prince was kept simple. This card design was cased from a swap I participated in with my upline. I loved the simplicity of the design and my husband loves monkeys. Inside the card, I layered a piece of whisper white cardstock and I stamped one candle in honor of little Prince turning one. Alas, thou ist almost to the end of the Castle. My final two projects showcase a scrapbook pages I’ve created for my little Prince. As you can see, my little Prince actually wore his party hat! I absolutely love this scrapbook page with a classic layout. The photos are the main feature sandwiched between the title with the accents being stamped images from the “Party This Way” stamp set. The second scrapbook page focuses on the guest autographs. I started the “autograph page” tradition with my nieces and plan to continue it with my little Prince. Alas, Good Friends, ’tis with sorrow that we’ve come to the end of my Castle for this Royal Tour! ‘Twas all my pleasure as thee host and I pray that thee enjoy the other Royal Castles of the Royal Blog Tour. I thank thee for thine visit and wish you a fare thee well on your travels. Perchance though wouldst desire the opportunity to win some blog candy! To be entered into a drawing for blog candy, thee MUST provide your name and email address which may be sent via email to [email protected] or include the information in your comment. The second requirement to winning Blog Candy is having thee leave a comment on my post. NextWow! I love being a Princess. What Happened to SunnyGirlScraps on Facebook? WooHoo… Tomorrow is the Staples Adoption Crop Fundraiser! Color Renovation Update – Blush Blossom. What fun projects! 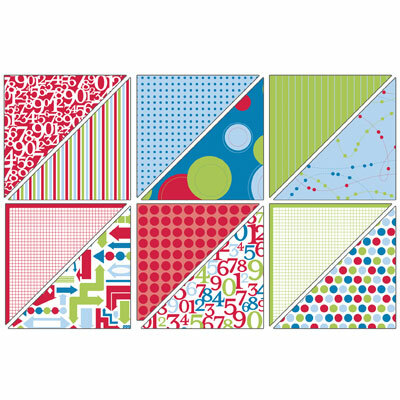 I love how bright and cheerful this Designer Series Paper is. Thanks for the chance to win. Oh wow! What a great birthday party. My little guys birthday is coming up and you have given me all kinds of ideas. Wow! It's fabulous! And yes, your husband is a saint to help you! My hubby likes to make creative comments, but he'd laugh if I asked for help! I love your scrapbook page too — your son's adorable! TFS! I LOVE your work, it made me smile and what a great keep sake with people writing on the page for the 1st birthday. Its adborable. Thanks so much for sharing. Wow – how festive! I feel a party coming on!! Love your work! Absolutely fabulous projects. Thanks so much for sharing & inspiring! Great job on coordinating your party invites, scrapbook page etc. Love your son's scrapbook page the best. (he is a cutie) Great ideas and thanks for sharing. Cute Prince! Such bright and cheery projects! Thanks. Good colors, designs and creativity… They inspired me for the next party. The stamp set with the paper go so well together. I love them. What a cute baby you have!!! The scrapbook page is my favorite just because of the cutie pictured on it!!! Thanks for sharing. what a fun stop on the blog tour. i am going to have to copy the scrapbook autograph page, very clever! and I love love love your first card. TFS! WHAT…WHAT FUN projects…These are all truly amazing. The first card is WOW! Then the matching hat and party favors and more…OH MY! Thank you for being a Princess and sharing your artwork. What beautiful BRIGHT (which I love) projects!! That has to be the cutest party set and invite I have even seen!!! And it's soooo nice to see someone post some layouts! Love it all!!! 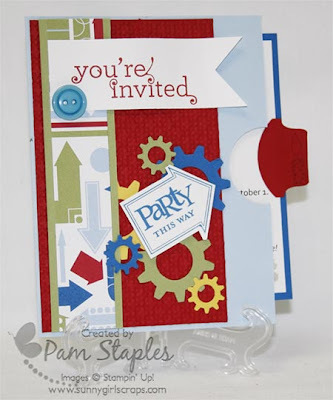 I love the way you used this stamp set and the cogs punch. Very cute! What a fresh break from Christmas themed stuff. Very fun. Thanks for sharing with us. Thank You Princess Pam for the Royal Tour. Love the pages, but especially the one with guest signatures! So cute! Thank goodness someone chose to celebrate birthdays in December 🙂 I love the rich bold colors. They make me happy and ready to have a good old fashion BD Party. Wow! These are fantastic. I especially LOVE the party hat and favors. The scrapbook page is wonderful too! I love the colors! They really stand out on all your projects, and that stamp set is so adorable. Awesome job, thanks for sharing! Your projects are awesome, I absolutely love this stamp set thank you for sharing your talent. Love your work. Super sweet adorable projects! 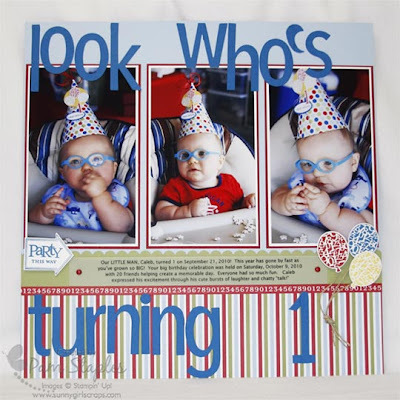 Love your page layout too – happy birthday to your little one, SO cute!! I love the idea of the layout that guests sign. You can't go wrong with the bright colors for kid's birthday! The monkey card is so cute, so is your little prince!!! Love your scrapbook page! What a great idea to have the guests sign a page for the scrapbook. Your son is a cutie pie! I love all of your projects and cards. Like the song says Are we ready to party! You really showed how to have fun. Thanks for sharing. Well I'm not surprised by how many comments you got on these projects. How very creative you are to make such fun things for a party!! But you know what, I love all of it, but your "Look Who's Turning 1" album page is so darn cute!! Thanks for offering such nice blog candy. Precious scrapbook page! So colorful and fun! I absolutely love your projects!! Very Nice!! Now I have some ideas of things to make and send from my new grandson's 1st birthday next year. TFS! Wow.. all beautiful projects and great scrapbook pages! Love your first card, lots of fun! Love your projects! The scrapbook layout is fabulous! Thanks for sharing!!! What a fun stamp set. I seem to overlook this one when paging through the catalog. Thanks for sharing some wonderful ideas and for a chance at some great blog candy. Awesome projects, I absolutely love the invitation. Thanks for all the ideas. My email address is [email protected] and my name is Marion Wilkinson. Thanks again! Never thought this stamp set with the DSP would look so fun to work with! Thanks for your ideas, might CASE a few! LOL! My email is [email protected]. TFS! so amazing! I can't even pick my favorite! Ok, maybe the one with that cute baby in it! Love that scrapbook page and those glasses!! Cute ideas really love the party pictures with the cute baby. thanks. What a handsome prince and I loved the party theme. I looked like he did too. What a great birthday ensemble. I love everything about it. Thanks for sharing! The autograph page is genius! Everything about this is just great. Hi neighbor, I live in Raleigh. Found your blog a couple of weeks ago. I LOVE the samples in this post, especially the invitation and SB page. Thanks for sharing. Blessings! Great projects!!! I love the idea of the autographed page. I have never, ever, seen that in a scrapbook page before and I absolutely love it!! Wow….how cute!! That invite has so much going on, and I bout swallowed my chewin gum when I saw the adorable baby on the SB page! Great projects! Great projects. I especially love the scrapbook page. I really like your invitation and what a nice hubby to help too!! Your little prince is very lucky to have such a talented Mother. He will be the envy of all the children. All of your projects were great. Thanks for sharing. Very creative and lovely projects. 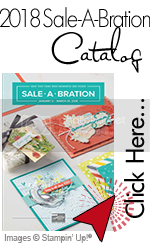 Love the invitation and your scrapbook pages are awesome. Your little prince is a cutie. Thanks for sharing your creativity. I love every single project! Thank you for sharing your time and talents! I think my favorite has got to be the Look Who's Turning One. What an adorable baby. Thanks for the inspiration. I love the idea of having all the children leaving the autographs really good idea! I love your projects because I must admit when I see this paper and stamp set I'm at a loss for good ideas. Now I see how to use them! I love that invitation – so bright and cheerful for a first birthday. But everything was so bright and cheerful. I would even wear that hat but you'd need a much higher number on it. Thanks for sharing all your ideas. I really like your projects. The colors are so bright and cheery- just right for children's birthdays. Thanks for offering great blog candy. Loved your blog and your little baby. Thanks for sharing great projects. Party on, Pam. You and your hubby are the best for going through all this for your son's 1st birthday. Great designs, color and ideas. You rock! Thanks for the awesome blog candy offer! 50 invites–your husband must be a professional now! Cute party hat & favors. That scrapbook page is just darling. Your projects brought a smile to my face — they are so cheerful and bright. I liked them all! As for the blog candy — wow wee. TFS and offering the candy. Having a husband that helps with crafting is something really fun. The invitation were fantastic and you have some very fun party ideas. These are wonderful… I bet your little prince had a wonderful day! I love the hat you made him! 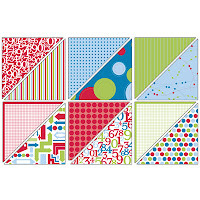 Love you projects with this stamp set and coordinating DSP. I especially love the scrapbook page…too cute! I love your fun projects! That scrapbook page is just too cute! I love the scrap pages! So cute! Thank you for sharing and for a chance to win some candy. The pages and cards are so colorful and cute! I loved the scrapbook pages for the 1-year-old. Thine projects are so fun, especially the scrapbook page. Thank thee for the opportunity to win thine blog candy! Connie F.
What fun projects!! Love them all! I must case these for the next grandkids birthday! Thanks for sharing & a chance to win! Love your blog and your ideas! Thanks for sharing how you made them. Thanks also for the chance to win blog candy! I love the scrapbook page with the baby – absolutely adorable!!! Thanks for sharing and the chance to win. Love what you've done with your featured set! I especially love the scrapbook page and the guest page! Cute! Cute! Cute! Thanks for sharing your time and talent with us here on the RBT! Fantastic projects! What a great site! I'll be returning as there is so much to see and do here! Truly Wow set of projects. And a Wow blog in general. Truly thy hast taken thy royal duties seriously and provided a goodly show of entertainment and inspiration to lighten and guide our journey! Pam: Your projects are adorable. I love all the different ways you used your featured stamp set! Thanks for being on the tour and for all your hard work as a CT. 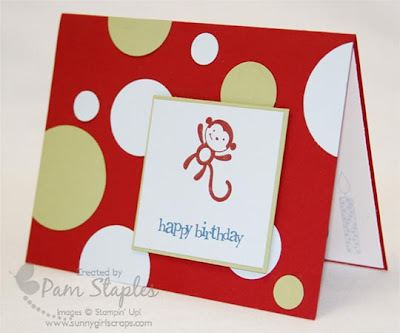 These are great projects and I love the monkey card! Its so simple just is super cool. I love the invitation as well. I've been intrigued by this stamp set for a while and so its awesome to see some fun samples with it. Thanks for sharing!